Last weekend we went to our first Julia’s House family BBQ. We weren’t sure what to expect but we knew it would be a good experience for us. Being honest, truly honest, at first it was a bit daunting. We had never seen so many wheelchairs or special buggies in one place at a time. There was a fantastic turn-out and the place was full of children with all manner of additional needs/medical problems/disabilities etc. But that feeling literally only lasted a few minutes and as we looked around, we saw what seemed like every other family with a feed pump or some kind of equipment attached to their wheelchair. We smiled to each other and my husband said: ‘at last we are normal!’. No one batted an eyelid at us. No one stared. No one wondered. No one stood looking awkwardly at Samuel wondering if perhaps something wasn’t quite right. No one patronised us, felt sorry for us, told us how brave we were or asked awkward questions. Everyone just got on enjoying themselves (and trying to keep track of the more mobile children!). I’m starting to get to know more Mum’s from Julia’s House so of course it was wonderful to see them and have a good old natter about all the things that are part of our everyday life – gastrostomy buttons, therapists, seizures, ketogenic diet and so on. It was also lovely to see the carers and nurses there too, who all took the time to come around and chat with the families and children. Quite often I’d look up to see one of Sam’s carers or nurses holding his hand and chatting to him. There were fun activities for all the children and their siblings – bouncy castle, craft tent, music, a pet corner (I believe a snake was available for ‘cuddles’), play sessions with the Play Maker, face painting, BBQ, ice cream and to end the day there was an amazing (and brave) fire display. This wasn’t a fundraising event for Julia’s House. They organise this every year for families to get together and just enjoy themselves and enjoy being part of a very special community. I think Samuel, his Dad and I fell in love with Julia’s House all over again that day. To find out more about the wonderful work Julia’s House does watch this video. 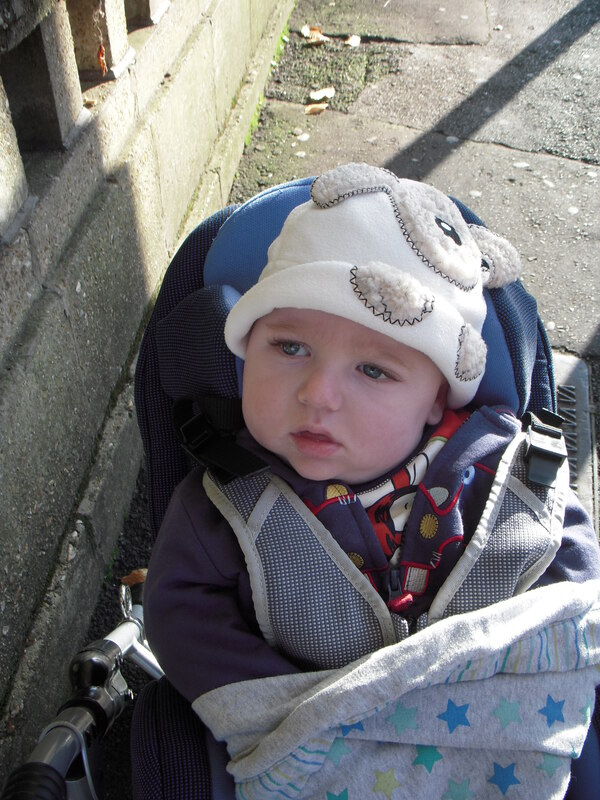 We picked up Sam’s new buggy on Friday, a new ‘special’ buggy. The Occupational Therapist wasn’t happy with how unsuported he was in his old one – we use to have to put in rolled up towels to try and improve his positioning – and he was growing out of it fast. I think husband and I both felt a bit hesistant at first about it, as yes it does look a bit ‘special needs’ but that lasted about 5 minutes once we saw him in it and how well supported he is. We took the new buggy out at the weekend but did make the mistake of picking a day when the German market was in town and it was absolutely heaving with people. I did feel extra protective of him as he seems much more exposed in his new buggy and people seemed to be walking really close to us. But we then went for a picnic in the park and set up Sam’s gastrostomy pump and we all ate al fresco. People walked past us and I did notice them looking at Samuel, but they didn’t stare in that awful way, but instead titled their head to one side and smiled. That’s Samuel’s magic, he can touch anyone’s heart.